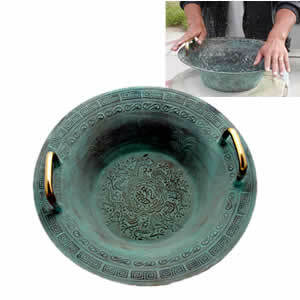 Each bowl is hand-cast out of Green Patina Brass, with a fine detailing of intertwined Dragons etched in the bottom. The bowls are toned similar to singing bowls, and are perfect for attunements and healing. The vibrations that are emitted from the bowl also help balance. To use the bowl, fill about half way with distilled water. Dampen your hands slightly, and rub the brass handles with the center of your palm and middle finger, using a steady pressure and speed. Once you get the motion right, a vibrating tone emits from the bowl and small sprinkles rise from the water. Legend has it the higher the water splashes, the greater your longevity.